Dubai: Motorists heading to Sharjah through Airport Tunnel should watch out – a new lane has opened. The Roads and Transport Authority (RTA) in Dubai opened a road on November 30, 2018 that separates traffic moving through Airport Road, which starts from Al Khawaneej and Shaikh Mohammad Bin Zayed Roads towards Airport Tunnel in the direction of Sharjah. Eng. Maitha Bin Adai, chief executive officer of Traffic and Roads Agency at the RTA, said the opening of the new lane, along with the associated traffic changes, separates Dubai-bound traffic to and from Nad Al Hamar. “The old bridge will now only lead backwards, and the new bridge will only lead leftwards in the direction of Dubai offering smooth traffic flow from Nad Al Hamar to Dubai. Traffic on the Airport Tunnel and on roads leading to Al Khawaneej Street before the tunnel will remain unchanged,” she said. Motorists heading to Airport Street in the direction of Beirut Street, Al Qusais and Sharjah should avoid the flyover at Rashidiya Metro Station. 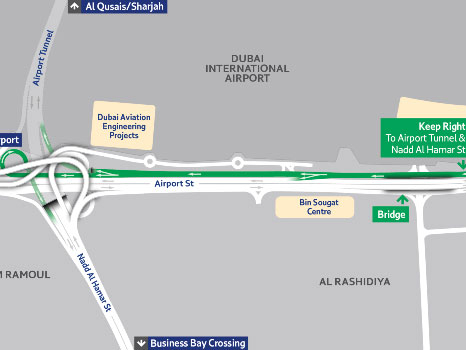 According to the new lane, motorists should drive instead towards the junction opposite the Dubai Airport Royal Air Wing and head to the right side of the bridge, which has an exit to the Airport Road. However, motorists driving to Dubai through the Airport Road can drive through the bridge. Bin Adai cautioned motorists to watch out for the new signboards and carefully read the arrows that indicates the road’s destinations. “Motorists are advised to choose the designated lanes for each direction early, and avoid sudden swerves or lane-changes. They also have to avoid slowing down in a way that disrupts the traffic flow, especially those heading to Nad Al Hamar and Airport Road, in the direction of Al Qusais and Sharjah,” she said. 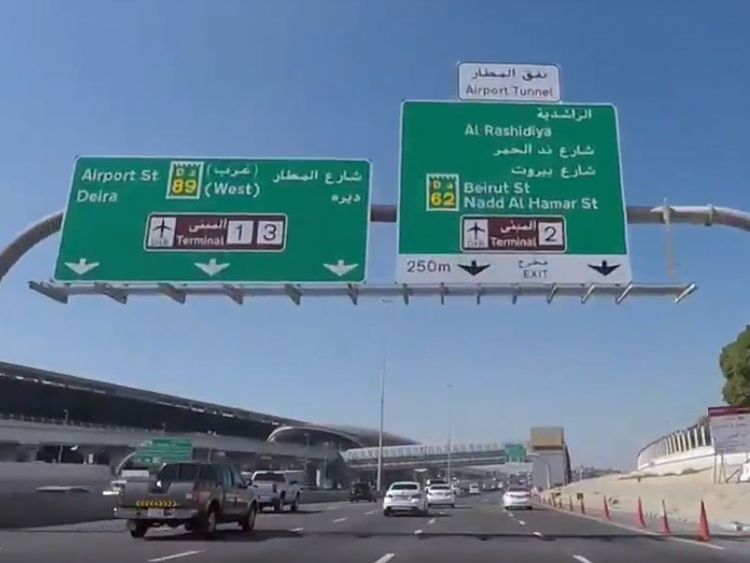 “They need to use the traffic junction of Rashidiya near the Dubai Airport Royal Air Wing, and take the right lane early to avoid disrupting the traffic on the bridge,” said Bin Adai. The Airport Road Improvement Project was able to increase the capacity of Airport Rd by 5,000 additional vehicles per hour, according to statistics provided by the RTA. It also improved the level of traffic safety and reduced the journey time from Shaikh Mohammad Bin Zayed Road to Casablanca Street from 30 minutes down to only five.